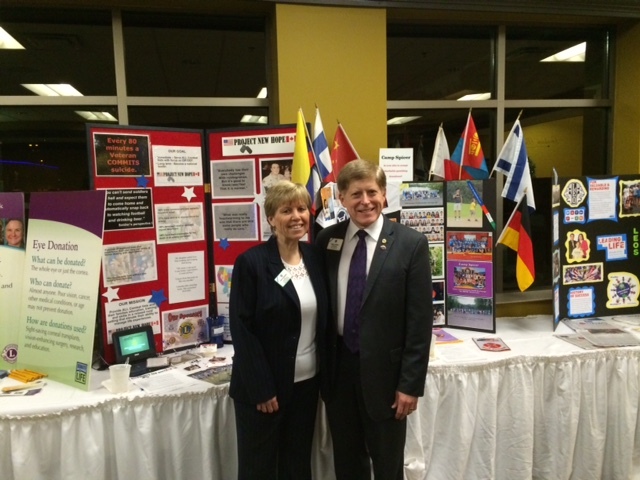 Kathy and I represented Lions Clubs International at the the District 5M-1 Lions Midwinter Convention that was held last weekend in Rochester, MN. The convention planners scheduled a variety of programs and motivational speakers. Booths depicting the projects and causes supported by Lions of 5M-1 filled the lobby of the convention center and we were welcomed with open arms. It didn’t hurt that there were many North Dakota State University fans in the crowd, including Council Chair Earl Orvik, whose brother is a member of the Fargo Gateway Lions Club. 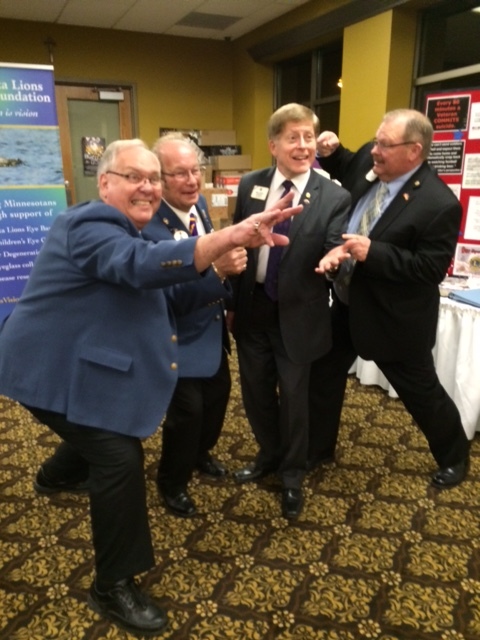 We had a great time spending time with CC Earl Orvik, District Governor James Dunlap, and the other district officers; and we were greeted by the Minnesota candidate seeking endorsement to run for International Director from Multiple District 5M–PCC Bruce Beck. The Lions of 5M-1 are a lot of fun as you can see from the photo below! There also was some fun ribbing about my Minnesota roots; but Kathy and I assured those present that we represented and brought greetings from Multiple District 5. 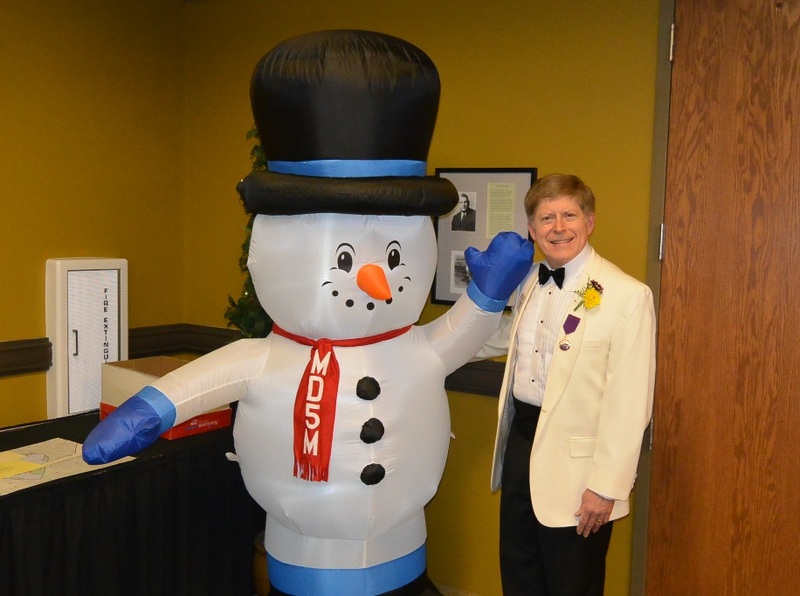 When all is said and done, MD5 and MD5M share a common root as both were originally part of the original fifth district created by Lions Clubs International. The 5M Snowman was present and we even got a hug. 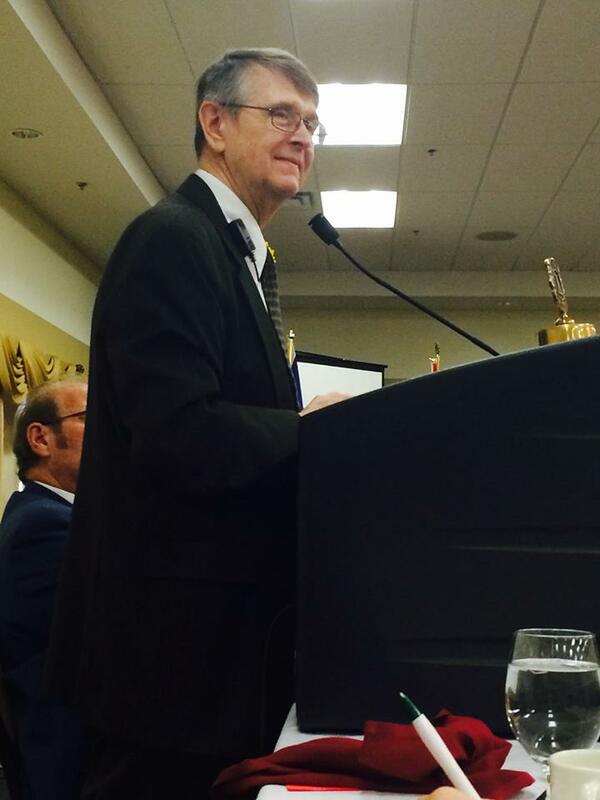 The speakers at the convention focused on vision-related topics. 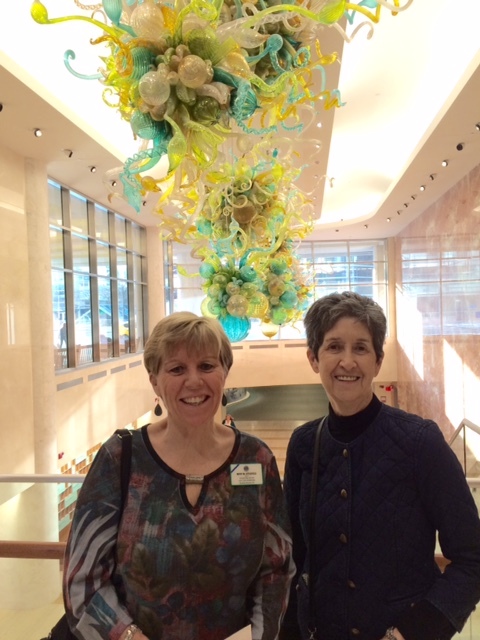 At Saturday’s noon luncheon, two speakers talked about the significance of the work of Minnesota Lions Eye Bank. The first speaker received a cornea transplant from the Eye Bank ten years ago when, at the age of 40, she noticed a problem with her sight in one eye. Eventually, she was diagnosed with a disease that usually occurs during adolescence, but that would eventually reduce her vision to 20-400. As a kindergarden teacher in Hopkins, her career and quality of life were seriously threatened. But because of a donor cornea, she recovered her sight and has been able to manage any complications that have come her way. She is currently working with Pearson Publishing bringing special curriculum and teacher training to teachers in the field. The second speaker, Deborah Hadley, also shared an inspirational story. She lost her two grown children within nine months. Her daughter was diagnosed with epilepsy at age 20 and died fours years later after a grand mal seizure that several physicians had said would never take her life. Nine months later, her 20 year-old son died along with three others in a car crash during a winter storm. As an organ donor, her son Tyler’s eyes and tissues benefitted several recipients. Deborah’s message was one of gratitude, faith, and hope. To honor her children, the family started the KT Foundation with a Fun Run (“The Color Run”), Christian music concert, and other activities to benefit families experiencing similar loss. Carroll Jackson, a field representative for Leader Dogs for the Blind spoke at the Sunday brunch about his role as a spokesperson and his experiences with Leader Dog. His presentation brought the listeners up to date on the technology that is now available to give the visually impaired increased independence. GPS systems in combination with a leader dog is opening new doors for the blind. His positive response to the challenges he faced were inspirational and when he finished, the Lions of 5M-1 raised 1,000 for the new kennel capital campaign project. The convention planners kept us both busy with speeches and presentations. Kathy talked about the One Shot, One Life Measles Initiative. I inducted two new members at the noon luncheon, spoke with club presidents, updated delegates on the work of the board, and provided the banquet address. It was my pleasure to present friendship banners to leaders in the district, as well as special guests ID Deb Wasserman and her husband Steve who attended the banquet. We acknowledged some hardworking and deserving Lions with gift bags bearing North Dakota products–pasta from Carrington, chocolate from Fargo, and several donated items from NDSU–home of the FCS Division I Football Champions. We presented Presidential certificates of appreciation, two Leadership Medals, and a Presidential Medal to PDG Jane Orvik. It was a wonderful event. I have lived my entire life in Minnesota, but have never been guided through the Mayo. Many displays, both historical and artistic, were memorable. The mission of the Mayo, the scope and size of its operations, and the standard of care made lasting impressions. To begin, visitors to the Mayo Clinic witness its evolution in the “subway” mural that displays many photographic illustrations of the founder, Dr. William Worrall Mayo, and his two sons, Dr. Charlie and Dr. Will. For over 150 years, this world-renowned medical facility has provided health care to millions of patients. The Wall of Donors, the exhibits featuring surgical tools and instruments, and the historical museum provide visitors with a chronological record of the Mayo. For example, the first ambulance appears to be little more than a wooden carriage with a flat wooden stretcher on wheels. However, technology expanded quickly and the Mayo founding family recruited the very best specialists, researchers, teachers, and staff that soon garnered a stellar reputation for providing award-winning care. Another artifact that demonstrates the uniqueness of the Mayo is the machine for the first American heart-lung bypass surgery and a letter from the young girl who underwent this procedure. The museum pieces included family heirlooms and historical evidence that display the chronological expansion of the Mayo Clinic and the endorsement/support from U.S. presidents, royalty, world leaders, and celebrities. In recognition of the standard of excellence in medicine and research, or to express gratitude for the care they received, many patients and their families bestowed tokens of appreciation to their caregivers or to the Clinic. Examples include porcelain dishes, glass works, art treasures especially Chinese vases. Throughout this museum, the visitor is reminded of the mission of the Mayo: “To inspire hope and contribute to health and well being by providing the best care to every patient through integrated clinical practice, education, and research.” A quote that I cannot forget is incorporated into one wall display: “Every patient is an ambassador for the Mayo.” At Mayo, every employee is expected to uphold the highest standard of care and responsibility. When I think of the over 40,000 employees of the Mayo Clinic in Rochester alone, I am overwhelmed at the magnitude of their efforts and the impact each has on people they serve. As we entered a parking garage, I noticed that even the attendant was wearing a dress shirt and tie. Pictured here with me is Margaret Larson. Walking through this enormous facility, I felt that patient comfort was paramount, in that the aesthetic beauty and spirituality surrounds waiting rooms and lobby areas. From the many pianos (with actual pianists performing live), paintings, and colorful glass, copper, and bronze sculptures, there is a sense of life and hope to inspire patients as well as guests. Up the street from the main entrance is the original building, St. Mary’s Hospital. The true pioneers of St. Mary’s are the Sisters of Saint Francis. These courageous women raised the money for the hospital and served as its first nurses and administators. From 1889, their history comes alive with the many photos and artifacts on display. I think that the most important is the original stone cross that sat atop Saint Mary’s Hospital. Dr. William Mayo paid tribute often to the sisters. 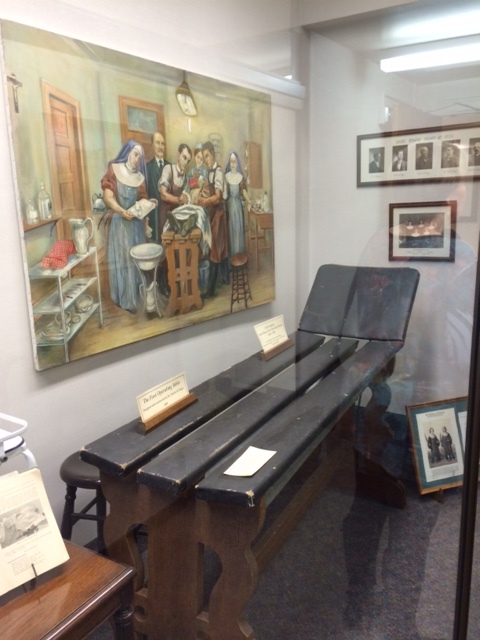 A small room on the ground floor displays the first surgical operating “table” invented by Dr. William Mayo. A display also shows that special care every patient received in that a bowl of fruit and flowers graced every room! Other items displayed include surgical tools from the early 20th century and many pictures of the nuns. One wing of the hospital is named after a gifted poet and hospital administrator Sister Brigh Cassidy. Leaving the Mayo, one last inscription reminds us all of a universal truth: “Love always wins.” The Mayo Clinic and St. Mary’s Hospital was founded on the principles of love, service, and charity. It continues to uphold these values. 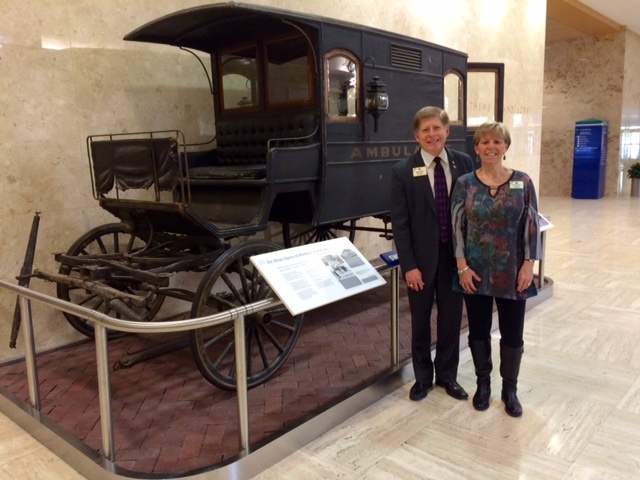 1 – Every patient is an ambassador for the Mayo Clinic. 2 – William Mayo, and his sons William and Charles, opened the doors to specialists who brought with them their unique talents and expertise to build a premier world-class medical center. 3 – The Mayos were active in civic and professional activities to benefit their community and world. 4 – The belief that “love always wins ” guided their lives and work. 1 – Every Lion is an ambassador for Lions Clubs International and our mission of service to the world. A Lion is a Lion is a Lion. We are all ambassadors every day. 2 – Lions open their doors to everyone, seeking members who can add their talents and abilities to help us serve those in need. We are all different, yet we share a common dream–that every man, woman, and child who needs a helping hand will find a Lion there to lift them up and give them hope for a brighter tomorrow. 3 – Lions are active in their communities, clubs, districts, and world. 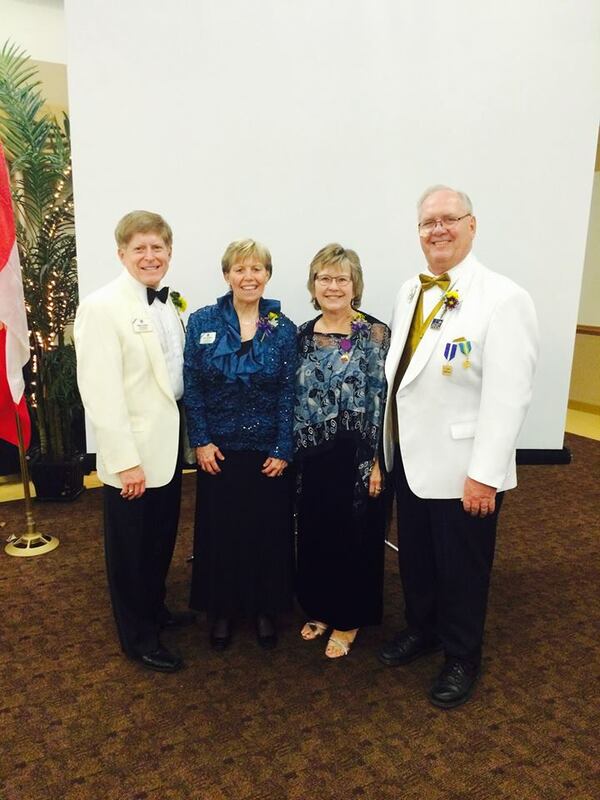 4 – Love is at the heart of Lionism. As Deborah Hadley shared with us, “when we act with love, it lasts forever.” Lions are Loving Individuals Offering Needed Service. As the convention came to a close, Kathy and I drove North to Moorhead and recounted all of our positive experiences in Rochester. We agreed that being able to represent LCI was an honor we will always treasure.